This post is sponsored by FunBites. 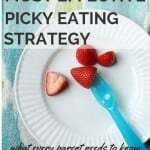 A few weeks ago I published a post about the best picky eating strategy I can give you, to not pressure your kid to actually eat. If you missed that, head over there first and then come on back! I knew it was going to be a hot button issue, but even I was surprised at the response. So, thank you for your patience, many of you have been asking for details on how to actually make the no-pressure meal time work in your home. I am back today with specific guidelines and solutions to really help you put the no-pressure tactic into effect so that you can watch the, often amazing, results unfold. As a pediatric OT and mom that practices this picky eating strategy, I really do believe it is the BEST solution in most instances. Since there were so many questions on facebook and in the comments of the last post, I want to answer them all here, Q and A style. This should cover all those burning questions, but if I missed anything or you need more clarification, please leave a comment. I love hearing from you guys and your comments really help each other. Having a child that is an extreme picky eater often feels very isolating. Of course, I know how many kids and their families are struggling, but many reading don’t know that. Your story or questions will likely help someone else, so please feel free to share! Also, as I said in the last post, I know some of you may have strong feelings against this approach. I completely welcome constructive comments, but please refrain from negative or rude comments. Before we get into the questions, I have to give a BIG thanks to our wonderful sponsor, FunBites. They have been a generous supporter of Your Kid’s Table and help keep the content coming to parents and professionals that need it. 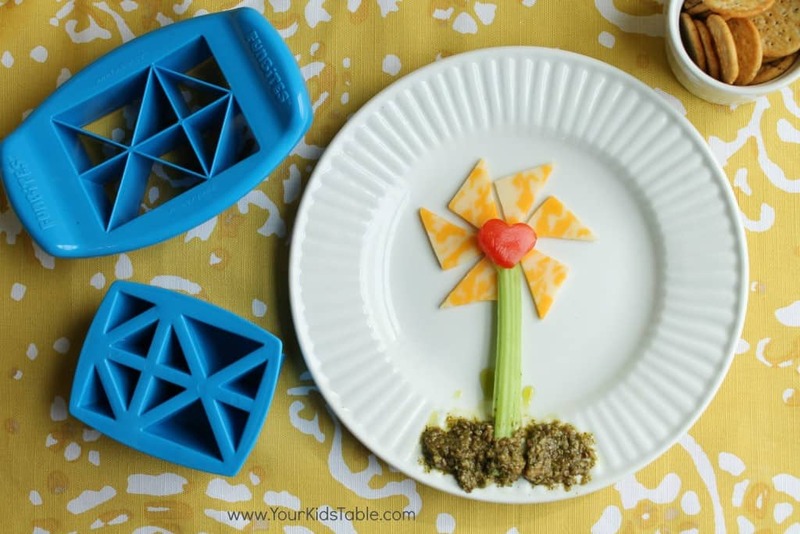 My kids and I love FunBites because they cut everything neatly,and quickly into fun shapes that are really motivating for the kids. 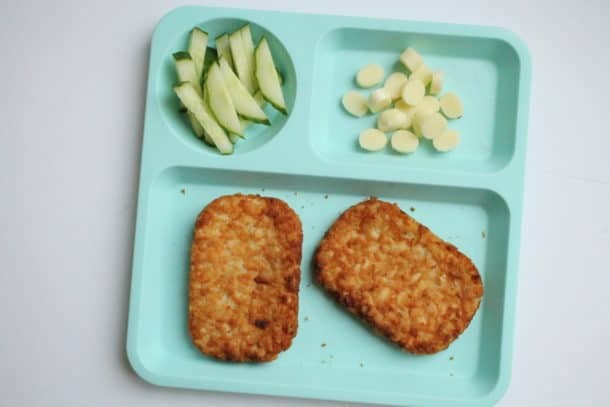 Picky eaters respond really well to uniform shapes, and setting up pictures or scenes gets them interacting with (and even eating) foods they may have refused in the past. See the end of the post for a coupon code. 1. Okay, so, I just put the food in front of her, what if she ignores it or refuses? Here’s the thing, although I’m suggesting that you don’t pressure your child to eat, I am not saying that means that meal time is a free for all. In fact, quite the opposite. The last thing I would want is for your child to eat when, where, and what they want. Deciding those terms is the job of the parent. The child’s job is to decide if they are going to eat it or not. In my eating basics tab, I run through all of the important elements to having an important structure and routine, but I want to run through some of them quickly here, too. Not pressuring your child to eat doesn’t work too well without mealtime structure. As the parent, you must determine what is being served for the meal, ensuring at least one preferred food is available. If your child comes to the table and sees a plate of lasagna (which they have never eaten) it really isn’t fair to just say, “Your choice if you eat or not.” But, if you serve that lasagna with some bread (which they love) and maybe a side of fruit, then it is totally fair. It is also critically important that your child is on a schedule. They should eat every 2.5-3 hours with nothing in between but water. If they have access to food whenever they want it, they will not eat anyways. Eating at a table, and ideally eating together, will have a big impact on their success at meals. Grazing and eating in front of the TV regularly, also sabotage this strategy. If you are able to put this structure in place and they then refuse to eat, then, yes, you allow that. Honestly, there isn’t much you can do about it anyways, but spin your wheels, cause major anxiety, and power struggles. 2. What if my feeding therapist gave me the opposite advice? I’ve been using a behavioral approach, should I stop doing that? While it is becoming less popular, it is true that many therapists use a behavioral approach (i.e. take a bite of this and then you can have this candy/video/preferred food). I can appreciate the value in this approach and some families feel this is the right approach for their child, I totally respect that. These posts are not meant to shame or guilt you into a different approach. If you have concerns, discuss them with your therapist, leave a comment here, or consider seeking out other opinions. 3. At what age can you start implementing this? My toddler isn’t going to understand. This concept can be difficult with young toddlers, and I think there is some leeway, but you’ll want to refer back to that structure I discussed in question 1. That all applies for them too, and in some ways it is even more important. Keep in mind that toddlers are notoriously inconsistent eaters, this comes with the territory. Your job is not to freak out (I know easier said than done) and trust that they are following their internal cues. By the time your child is 18 months to 2 years old, you should be able to totally follow this approach completely without having to maybe grab something extra part-way into the meal if they aren’t eating. 4. What is the difference with praise and pressuring? 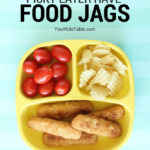 In the last post, I quickly ran through some example of how we pressure kids to eat. One of those ways is through praise. This often surprises parents the most, and I didn’t have time to get into it in the last post, so I’ll elaborate here. Research shows us that kids usually feel pressured when they are praised because it is either putting the spotlight on them which most kids don’t like, or it’s setting an expectation that they have a hard time living up to. If you really want to acknowledge what you child has done, try to wait to end of the meal and make a comment in passing. Although we want to give them the praise, they actually don’t need it when it comes to eating. Instead, we want to teach them to be intrinsically motivated. 5. My gut is telling me this is the way to go, but I’m scared, what if my son doesn’t eat anything? This is a valid point, and there are some instances when this is a genuine concern, and in these cases the child should be in the care of a team with a specific feeding plan in place. If your child is growing on a curve, then they are probably eating enough. We tend to over analyze what our kids eat, and their caloric needs are significantly less than ours. It can be hard to let go of the control or worry, but I encourage families to try this for a month and see what the results are. 6. Do I keep giving them more of the preferred food or do I tell them they need to eat more of their other foods first? Ellyn Satter would say yes, give them as much preferred food as they want, and that would be truly following the Division of Responsibility. I know this is hard for a lot of parents, and I personally feel there is some gray area here, but parents need to tread very cautiously because putting any restrictions on food is a quick slip into pressuring. With my oldest, that doesn’t have any eating issues, and eats a wide variety, I will occasionally give a prompt for him to eat some more of his food before he just has more bread. I know he eats these foods, I don’t give a specific quantity or make a big deal about it. I’m also careful to not turn this into a reward, but technically I am pressuring a bit. However, I don’t get into power struggles over this or monitor his intake closely. At the same time, if he or my selective eating child have things on their plate they don’t typically eat, I don’t make the comment. I will use other strategies like, changing up the food they are refusing by cutting it into a different size or shape or by giving a dip. 7. Does the no pressure apply to eating desirable quantities of food in general, especially if my son only eats a small amount? Yes! Building on what I just said there is a bit of wiggle room, but you’ll definitely want to avoid specific quantity suggestions, bartering, etc. my kids will try to manipulate me into feeding them something in the time between after dinner and before bed. They wont eat what I make r just the one thing that is preferred and so they are obviously still hungry before bed. should I just say to bad and stick to I’m not a short order cook and to bad you can eat in the morning? or what do I do? I am a push over so I will mostly just give in unless you thing holding out to that’s dinner and that’s it. Hi thank you so, so much for this and all of your articles and education. I’ve long known that my 10 year old son refuses to eat properly as a control issue. He only started his picky eating after we moved towns, and I went through a traumatic adjustment (he adjusted just fine- ironically). In any event, we try very hard to completely back off and just let him eat the 1-2 things at the dinner table that he will eat. But honestly, when we do, he fills his body 100% with simple carbs- bread, cereal, fruits, rice, etc. He only eats protein and vegetables when told to (and reluctantly, but he will usually eat about 1/4 of the serving). I want him to want to feed himself nutritionally, but when left to his own devices, he simply never, ever does. He does drink tons of milk, so I know he gets protein. Should I just continue to let him choose to eat this way, knowing it is just simple carbs, and milk for protein (and a multi-vit for minerals)? He just seems too old to still be such a ‘simple’ eater and it worries me. He has stayed very consistent on his growth charts though- to our huge relief. Any advice would be sooo appreciated!! I totally get your concern, this is a personal call. For me, I don’t want to pressure or force because I believe the long terms gains are so worth it. 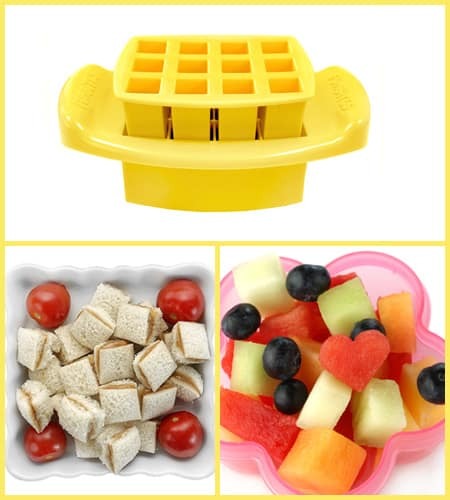 There are also other ways to encourage veggies without pressuring. Check out this post on how to get your kid to eat vegetables! Great advice, we are going to have a real crack at implementing this. My question is what about bed time food if they haven’t eaten their dinner? My 6 yr old will hold out until he’s in bed to ask for food and get a piece of fruit or carrot each night. Should I keep his dinner until then? The waiting until bed time to ask for food has created its own problem I so as disrupting bed time, but I can send him to bed with an empty stomach. Oh I love to hear that Kris!! I don’t ever reserve meals, when it’s over, it’s over. If appropriate, it could show up as leftovers a few days later though. You could do a scheduled bedtime snack to avoid this bedtime tactic, or if you’re eating late, just let him go to bed. I know this is a tough call, but I’d trust your gut on how to handle it in your situation. And, always check with your dr. if you aren’t sure. What age can I start implementing this? I have a 10 month old I just started on finger foods and it’s a fight every night. She is drinking less and less formula but isn’t all into food either. I know you mentioned the no milk or snacks in between meals but how do you handle a schedule for a 10 mo. old? What can i do if my son stuffs all the pieces in his mouth of the food he likes? I just place small bites on his tray an de let him eat before giving more. How could I in introduce more foods with this problem? I can’t lay a full plate in front of him. He said a picky eater and I’ve been pressuring him and have to stop. It’s likely going to take a lot of repetition in telling him, “too much”. Also, giving him some stimulation in his mouth a couple of times a day or even in the middle of a meal with a toothbrush (brush the sides and top of tongue) is a feeding trick that can help decrease the urge too, as weird as it sounds! I just wanted to thank you so much for taking the initiative and time to do this! It is thanks entirely to you & the dedicated people like you, who have filled the internet with helpful information, ideas, links, recipes, etc….to help kids (& no longer kids!) I literally (& ACCURATELY) diagnosed my first grandson from Pinterest (where I also found you) as having Childhood Apraxia of Speech, Sensory Processing Disorder & ADHD for starters. I have used all these sources repeatedly to find tweeks & tid bits to help on this long journey over the past 5 yrs and am absolutely grateful for every thing you do! I can’t wait to take my first webinar here today! Thanks again. Oh that’s so wonderful! Thank you so much and I hope you enjoyed the webinar! I have a similar issue to Tracey. My son who is now 21 months old, used to eat everything under the sun. Then around 17-18 months he just decided he didn’t want to eat most things that he used to love. He now eats most fruit, yogurt, cheese, peanut butter sandwiches, bread, pizza, waffles and any kind of cake/sweets. He also of course loves crackers, and also kids snacks (cereal puffs, etc.). The only way I can get him to eat veggies are in those snack pack things. Sometimes he’ll eat the occasional chicken nugget. It is beyond frustrating, because the list of “approved” items is shrinking. He loved macaroni and cheese, and also sweet potatoes, but now won’t even touch them. It doesn’t matter what shape the food is in, he just will refuse. I am running out of ideas of what to feed him. It is so frustrating. What do I do? Do I cave as I do most dinner times, and just give him the squeeze pack and fruit? I know it can be frustrating Aubrey! Have you signed up for the Free Picky Eating Workshop? In that workshop, you are going to learn my top strategies for turning picky eating around. You’ll learn more about this in the workshop, but it’s important serve them one food at every meal that they are likely to eat. This is a great article. I’m struggling a bit with my 3 year old daughter. She’s growing just fine and usually eats different foods (loves sushi, for example). But it’s hard to get her to try things that have a lot of ingredients in them, like stews, sauces other than tomato and bolognese, and she won’t eat sandwiches (she’ll just pick them apart). And lately, she asks for different plates for different foods (just like her daddy did when he was little!). The other problem I have is that she is extremely independent and loves to open the fridge and even get up on a chair to grab food out of the cupboards. Some people have told me to lock the fridge, but that seems so wrong. She gets really angry if I tell her to wait until dinner to have a snack, and will not listen, so my alternative is to physically grab something she is eating from her hand, and that also feels wrong. If she opens the fridge, she’ll usually go for fruit or bread, so it’s not like she’s filling up on total junk. But I still feel a bit powerless about this. We do sit at the table for breakfast, lunch and dinner (except if we’re at the park) and as a treat, I will ocassionally have breakfast in bed or on the sofa with her. Any suggestions? Sorry for the very long post! My 21 month old has just started to become a picky eater. He transitioned from breast milk to pureee food fabulously and ate everything I gave him and did the same when we introduced solids as finger food again eating everything we put in front of him. He’s learnt how to use a spoon and a fork but recently he’s started to reject all vegetables and has started eating with his fingers again. I’m a Type A mum and haven’t really let him get messy which I plan to change from now on after reading your posts, I hope it’s not to late. But I’m getting very frustrated that he won’t eat things he used to eat. I try not to pressure him and eat what he doesn’t want off his plate saying “hmmm it’s yummy”, is that pressuring? It’s difficult for us to eat at the same time as him because of my work time table for lunch and here in Spain we have dinner at 9pm so he’s already had his dinner and is in bed. He won’t try any new things or one day he’ll try it and eat it all and the next time we cook it he won’t eat it. It’s so frustrating and I hate to throw away food. I’ve continued to put the vegetables on his plate but it’s been about a month now and no change. I do try not to pressure and just suggest “why don’t you eat some peas, they’re yummy” and just shakes his head at me. (He’s not speaking much yet with learning 3 languages, but he understands most things). I’ve just read your 5 reasons why kids refuse to eat and I think there are few indications it might be sensory. He doesn’t like food that isn’t cut into a proper shape. What I mean is that if there’s anything “hanging off” it or it’s not a determined shape i.e. square, he won’t eat it. And if his undesired food does make it into his mouth (peas for example, he used to love but now won’t touch) he’ll spit it out with his tongue, in a urggg face motion ?. Another thing is that he doesn’t chew much. I have to tell him to chew more because if not he’ll swallow big chunks of meat. It doesn’t seem to bother him and doesn’t vomit but he does prefer either big chunks or things like rice that he doesn’t even chew! He’s only got his first molars and his canines are only just coming through so I don’t know if that could affect his eating? The teeth doesn’t affect eating, unless he’s teething and in pain, but if this has been a long term problem then likely not the cause:) It does sound sensory based! 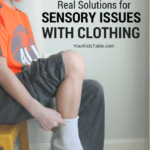 Did you see the post on sensory strategies? It’s not major pressure but it is pressure:) Think of it this way, if you’re saying or doing something to get them to eat than its probably pressure. Did you see the free workshop? The link was broken yesterday but its back up again! 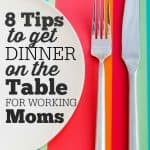 yourkidstable.com/free I think that will be really helpful for you! For the past year we have been struggling with our daughter to eat. Prior to turning 3 she was a fabulous eater. Would eat anything we put in front of her. Now she has become incredibly dismissive of food. She prefers to pick at it with her fingers and pretty much will only eat things that are sweet or she can eat with her fingers – she will pick peanut butter, cheese, butter off of bread, eat the icing off of cakes or cookies, eat the sprinkles off of donuts, eat chicken nuggets (but usually only a few bites and it can take up to an hour for her to eat a whole nugget), french fries. We can occasionally get her to eat a few bites of banana or apple, or she will nibble at the tops of broccoli. Other than that, she refuses to touch any foods. She does drink milk, apple juice, and water, and we started supplementing her with a protein/fiber drink (disguised as chocolate milk) when she began losing weight/having bowel issues. Most help we’ve received from specialists has just said ‘oh, she’ll grow out of it’ or ‘give her what she’ll eat’ but we already have an older (5) ASD child and trying to work out strategies for both of them has us at our wit’s end. Do you have any advice? Thank you so much, Alisha! I will give these all a try. Question – if my four year old decides not to eat do you make changes to plans that evening? For example, you didn’t eat so no toys or games tonight, or it’s early bedtime now, etc.? That is where I struggle the most. Thanks! I know this is hard, but no I wouldn’t take anything away. For me, those things have nothing to do with eating and if he has an underlying difficulty with eating, which many extreme picky eaters do he can’t bring himself to eat. If he’s growing well, I like to stick to serving at least one thing they eat most of the time and then just to let the rest go. It can be a hard thing to wrap your head around but once you do the stress will go down dramatically, for both of you. My 17 month old only drink milk from a bottle. I try to feed her food or sneak it in her mouth and she has a fifth. I need help on how to feed her. It sounds like she’s having difficulty learning how to eat. I highly recommend this post on how to transition to table food. Take a look and let me know if you have questions. 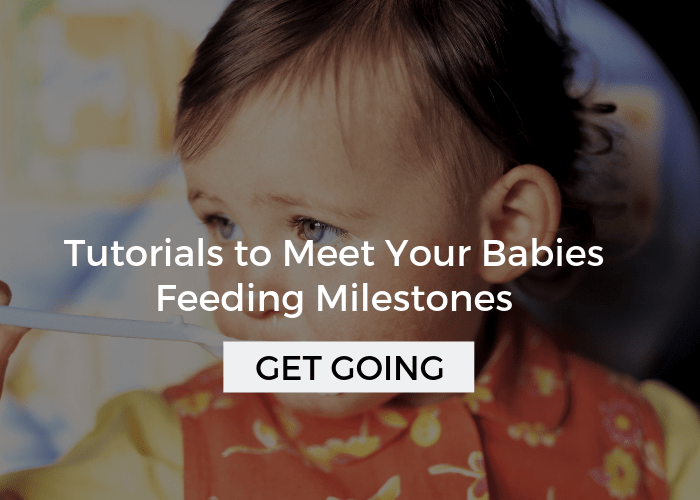 This will also be helpful, what do when baby won’t eat solids– even though she’s older now. I have a 5.5 yo boy that is afraid to try new foods. Or he will say he will, but when the chance comes, he completely refuses. He will shut down or cry. He has a limited diet but not enough to be a problem feeder. I make 2 meals every night. Now my almost 4 yo boy is imitating him and losing foods left and right “I don’t like that anymore”. I do not even know where to start. My only saving grace is that he’s happy to eat the same things almost daily (fruit, greek yogurt, and chicken or jelly sandwich) so he is physically healthy. I just do not know where to start. How do I get him to actually try a new food? I know it seems strange but it does actually start with not pressuring them, once you’re doing that there is more that you can do, you can find more advanced techniques in this post and this one. Both of these actually point to how to get them interacting with new foods. Did you see the free picky eating workshop that’s tonight and tomorrow, check that out here– I think it would be very helpful for you! Let me know if you have more questions! Hello. I believe my 4 yr old is a problem feeder. I’ve tried making food shapes and faces. I’ve tried making a meal with a part he prefers, he just eats that and says he’s full, then asks for food at bedtime. I’ve did the scheduled eating, and he chooses to go to sleep hungry. I am guilty of pressuring and bribery, and praise. None of which helped. I’m really at my wits end, and I’ve asked his pediatrician. He is underweight, and she just said cut out snacks and make sure he has at least three meals, which I’ve done. He has stopped eating basically anything with any nutrition, and he used to like them. He just wants junk, and everyone I ask says he will eat or starve, or just give him the things he will eat. I’ve tried eat it or starve and he would rather starve. I’ve tried giving him the stuff he likes, but I can’t afford for him to eat snacks like they are meals. I’m seriously on the verge of mental breakdowns, not to mention being disgusted when I try to hug him, and he just feels so tiny, and malnourished. Im so tired of “being a restaurant” as you described it, and making dinner, plus his 4 foods. And to top it off, even he is getting tired of eating the same 4 things, but refuses to even taste anything else. Really nice article, but whilst I understand the principles, the practical aspect is left hanging somewhat. What do you propose as a strategy for post dinner refusal where a child will inevitably end up saying ‘I’m really hungry’ ten minutes before bed and wanting something else? Because offering any kind of food here seems to me, to be re-enforcing the option of a ‘hold-out’ on a proper dinner because there’ll be others stuff later. Is this something to tackle at dinner time itself. or by restricting what may be offered later? Great question Ian, and to be honest its a tough call. It really depends on how close dinner is to bedtime. Some parents feel better about offering a bedtime snack and that’s fine, if they are the one’s that are controlling it. I like to offer before a child even asks OR make it a really healthy snack- something they will eat but may not be their first choice. If bedtime is too soon after (within an hour or so) it really can send the message to hold out. I also like to not offer the late snack every night, so they don’t depend on it. The best situation is to do your best to plan for something they will eat at the meal and that their meals are spaced out during the day so they are actually hungry when they sit down. 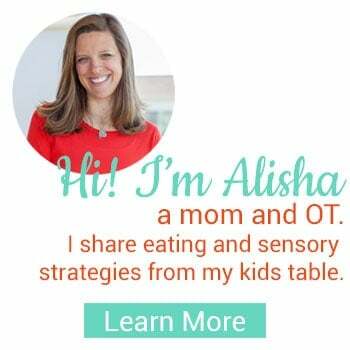 Hi Alisha, I have a 5 year old sensory child who attended eating therapy when she was 3.5 to 4. She also still goes to OT once a week to continue working on sensory issues. I’ve found that she has broadened her eating a bit but I feel stuck in a rut. I fix her basically the same meals throughout every week. We do a black bean, avocado, cheese quesadilla night. A spaghetti night (although she still will not eat absolutely any sauce so the noodles are plain), Pizza night, Open face Turkey sandwich night (she absolutely will not eat any sandwich that’s together except peanut butter and jelly). She will eat peas, corn, cucumber and carrots. So, I find myself making 2 meals. One for the kids (my 19 month old will pretty much eat anything) and then our meal. My goal by the time Sydney turns 6 is to prepare only one meal for the family and to try and stop giving rewards and no pressure. My husband tends to offer her a $1 if she can finish her meal before her cousin which is also terrible pressure I think but I find that I still prompt her more than I should or say “Make a Happy Plate and you can have X”. I appreciate the tips on no pressure. Do you have any advice on how to move to preparing one meal without the power struggles? That post will answer your question, exactly! Let me know if you need anything else! I’ve been trying to encourage my 3.5 year-old daughter to eat rather than forcing her like my parents did, as they used to look after her when I was working full time. It came to a point that my daughter will make herself fall asleep at meal time so she doesn’t need to eat. I simply couldn’t deal with the stress anymore and I’m so glad that I’ve found your articles a few days ago and have started to use your strategy. I do have a situation that I don’t know how to resolve: my daughter is now given the choice to take the food she likes and put on her plate, and she would take all the food she can see onto her plate but only eat one or two pieces of them. I end up having to throw all the food away, it’s so wasteful. I’ve tried explaining to her that it’s bad to waste food and ask her only take what she eats but she won’t listen. I’ve tried giving her less food to start with, then she asked for more but won’t eat the second portion she asked for. What would you suggest I should do? I don’t really want to pressure her to finish her food and ruin the progress we’ve been making. Great job Carly, moving forward and trying this strategy- it will be worth it!!! I would tell her she can only take one spoonful so that it doesn’t go to waste and let her know that she can only have more when that is gone. That should eliminate a lot of your problem. You may need to physically help her or remove the bowl once she is done. This is pretty new and I bet that once she gets used to this the novelty of taking a lot will wear off- just stay consistent. Before she takes more foods, ask her if she has room for that and help her to take a smaller amount. Great question! Hi, my 14 months old son decreases the appetite a lot lately. He was never a big eater but he even eats less now than 2 months ago. sometimes, he only eats two bites then starts spitting out the foods. Should I stop feeding him when he does? secondary, sometimes, he had a good amount of food during lunch time, then he refuses dinner. What should I do? but he always wants his bottle. Shouldn’t I give him milk during daytime, so he would be hungry for foods? but I am afraid he doesn’t get enough nutrition if I give him less milk (he’s drinking 20-24oz of milk a day now). It is normal for eating to decrease at this age. I want to point you to the start here tab in the menu bar. 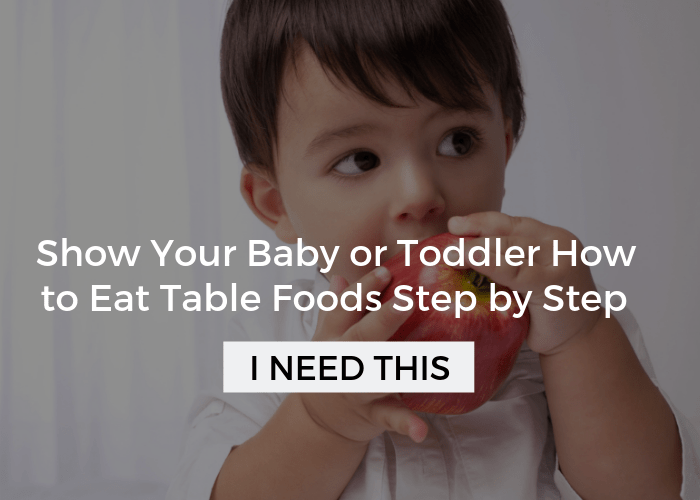 I give you step by step instructions for these exact questions:) I also have a new post on toddler eating that I think will be VERY helpful. 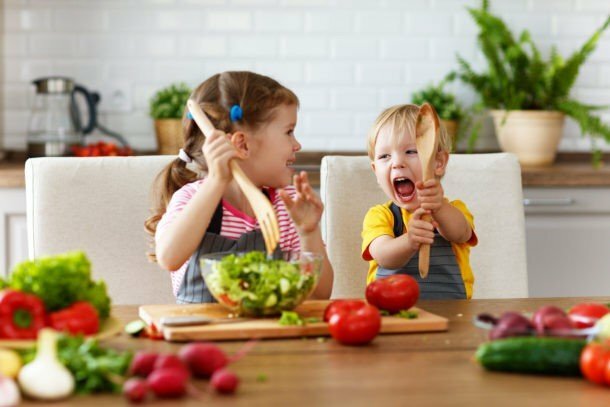 You can click through to the home page or the article index under start here to look for it: How to Prevent Toddlers From Becoming Picky Eaters. Only serve milk before bed (if you are now that can continue) and with his meals. That will totally spoil his appetite in between meals. My 12 month old twins don’t have a consistent food that they like. One day they will only eat peas and then for the next 3 they wont touch them. How do you suggest handling giving a “preferred” food option if there is no way of knowing what a preferred option is on that particular day? Do you just keep giving them options ( we often go through 4 or 5 choices) until you find out what they preferred food is for the day? At this age, that is really difficult, you can do a little of that for now, but if they eat a food 50% of the time then it is preferred. However, you have to be giving enough variety, too. If you are giving a lot of the same things they will be sick of them. For now, have 3-5 options ready to go. Present them all, and try to engage him in some play if he doesn’t eat. Demonstrate. Again, this is a hard age, and you have some leeway, but over the next 6 months you’ll want to move away from catering to him, slowly and steadily. He may have some meals that he doesn’t eat very well or anything at all. That’s okay and is totally normal for toddlers. They also require much less food now than they did as their growing slows. My daughter is 8 and eating has been an issue since she was 4. As a toddler, she ate a wide variety of things. Now, she is basically a vegetarian. I would not have any problem with that if I was sure she was getting enough protein. She won’t eat any beans or nuts. These things make her gag to the point of her eyes watering if she tries them. Is the protein she gets from spinach and milk enough for her growing body? I totally understand your concern… Is she drinking 16oz of milk a day? Is she underweight? What type of milk does she drink? If she isn’t overweight, I would give her whole milk with the added DHA just to ease your mind. Will she do yogurt or cheese or avocado? Those are also good sources. 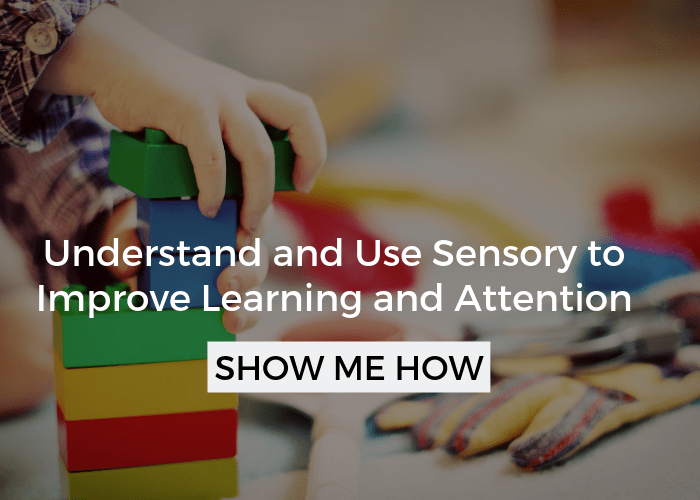 It’s hard to say exactly, but I can tell you that if your child is growing well and doesn’t seem to have a hard time focusing or a loss of energy then she is likely getting enough. I do have a question regarding the preferred foods part. My daughter is 19 months old and I do try and include an item on the menu that I know she’ll eat (usually). 1. What if all she does is eat that item and not even try the other items – should I just let her do that? 2. What if the preferred food is finished and she still continues to want more? 3. Also, on that topic, if she continues to want more of that item, does that mean she’s still hungry and should I offer her something else that I know she’ll eat or let her choose something from the other items offered (which she may or may not eat)? 4. What do I do if this happens during dinner time – should I try and give her something to eat before bed, whether she asks for it or not? She does currently have milk before bedtime, but I worry that she’ll wake up during the middle of the night due to hunger. So sorry for all the questions, but just need a bit of clarity on how to proceed some (most) days!! Hi Jaymini, I know navigating this all can be really tricky and I don’t want it to be difficult, really! At 19 months it is hard because they can’t understand a lot so to answer you first question- yes, and your second question I’d say generally yes. But, here’s the thing with toddlers you’ll want to try to change something up to help them be interested in the other foods. This won’t always work but it is worth a try. So, get a fork or a different spoon, give a squirt of dip, cut it up smaller, or give a big piece. The novelty will help them refocus. I would also try to demonstrate eating and interacting with the other foods. 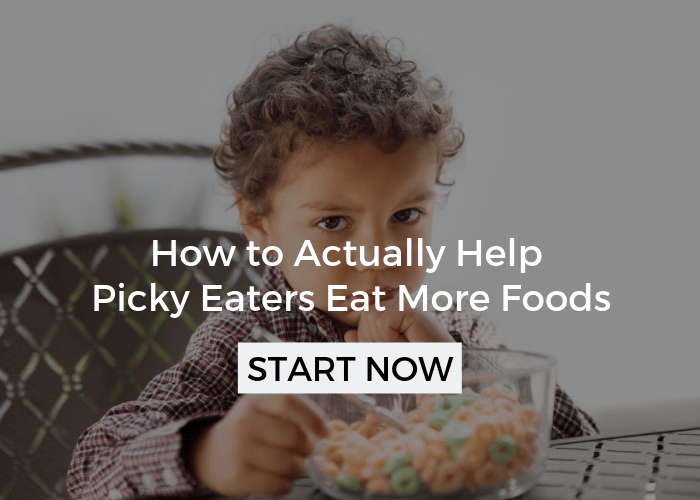 If you click on the article index and scroll down to picky eating, you’ll see a post called “getting your picky eater to explore new foods”. That will be helpful in understanding this concept better. Give her as much as she wants of the preferred item, but toddlers can get really stuck here so sometimes it is helpful to put the serving out and then put the source away (the bag of pretzels, etc.) where she can’t see it. If she needs more try to direct her to other foods in a playful light way, and then get her more. Don’t start pulling out lots of other foods. Make sure she always has one food she likes and if you give her milk before bed she’ll probably be fine. I have a 19 month old and this happens sometimes with no problem. If you feel better give her a snack, that’s fine. Hope that helps! 1. What if the preferred food is actually finished (as in we don’t have anymore of that item in the house), but she continues to want more during meal time? 2. During meal time, sometimes she has started to ask for something else that’s not on the menu. She sometimes does eat a decent meal and then asks for something else and there are times where she won’t eat what’s offered, but instead ask for another item not on the menu? What should I do in such instances? If there wasn’t a lot of the preferred food to begin with I would make sure there were two for that meal so you have a back up. But, don’t go get something else if she refuses that then. I would not give her something else, that is opening a big can of worms. It may make for a few unpleasant meals but she will learn. Just like she’ll learn if she can ask for crackers or whatever and you’ll get them. Does that make sense? Yes, thank you!! Hoping that she does actually become a good eater as she grows :)! Hi – thank you for these posts, I enjoyed both and I agree with it. I do have a question. My son likes to skip to the end of the meal and eat his treat, which is usually a homemade fruit and yogurt popsicle. He will have his plate in front of him, something like chicken, veggie and bread; and he’ll say he wants his popsicle. I’m trying not to pressure him to eat, so I’ll say “we have to eat a good mix of foods before going right to the popsicle”. And we talk about what “a good mix of foods mean”. And then he’ll just ask for his popsicle again. And we go around for a couple minutes. Again, I don’t want to pressure and I don’t want to present the popsicle as a reward. Any thoughts from anyone? Oh shoot! I forgot to mention about desserts, that’s a big one. You are handling this the same way I would. Instead though I’d have dessert a bit after dinner, that usually helps. Then you can say, oh we are going to dessert later, its dinner time right now. LOVE LOVE LOVE those pictures – and your words spoke to me – we moms are in the same place, trying to balance so very much and do it all perfectly!!! If we just give God our very best, everything else will work out. Of course! You could use extra oats or coconut, or sub in another favourite granola ingredient. Can you do seeds at all? I bet pumpkin seeds would work nicely. Wait. So they’re allowed to have dessert? Everyone has been telling me to keep dessert from him. I hate it. When at my mom’s house recently, my brother refused to let him have cake. He was left out of a birthday celebration and it felt very wrong. I get accused of being too “soft,” and I am worried about spoiling him, but this seems so mean. He’s three. He’s not awesome about understanding the future yet. ALSO – his pediatrician told me to just reheat the food that he won’t eat (save it for his next meal). I tried that, and he just didn’t eat. I caved after two meals because it’s too awful. Especially if he had a dipping sauce. Gross! The doctor said that he will not starve, he’s a big, healthy kid (96% in weight). So – he can still have dessert? I hate sending him to bed hungry. And he loves yogurt parfait, applesauce, bananas, etc. for dessert, as well as pastries. So, yes, I’d give him dessert!!! Thanks for this, I need reminding now again. My 4.5 yo struggles with new food. The only thing I’ve found that works is talk together about a new food (or a food he used to eat and no longer does) and decide which one he’d like to try and plan it into the weekly menu. The rest of the time I generally serve up the same old meals that I know he likes (about 6 meals) and I get a bit frustrated cooking the same things!! I do do the sticker reward thing so maybe I should stop that? My nearly 2 year on the other hand will try anything. I have been so much more relaxed with her and not analysed what or what she’s isn’t eating! I love menu planning and have a whole post devoted to that! 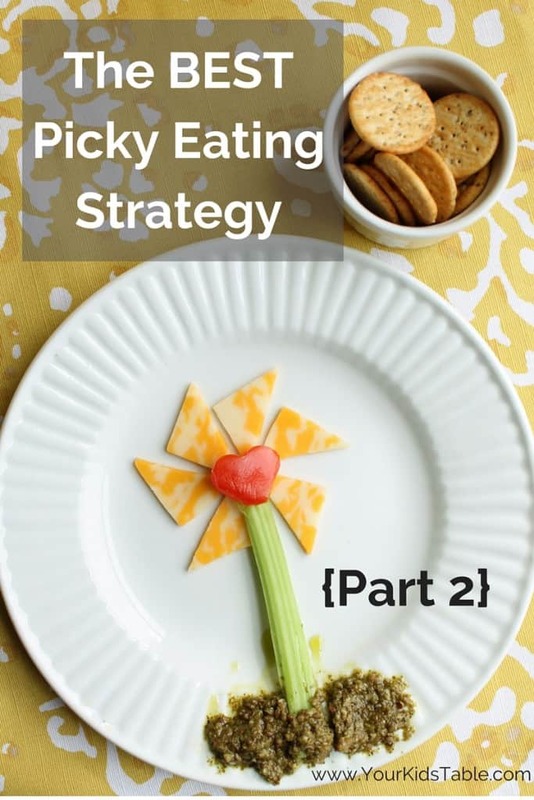 It is a great strategy for picky eaters. I would also encourage you to feel free to rotate other meals in, just make sure there is at least one side you know that he will eat, or maybe the main part of the meal. Glad this was helpful! We’re struggling with getting our 17mo to stay seated for meals, particularly dinnertime. I think part of the problem is that he likes to watch/”help” with food prep, which I love and want to encourage (we have a learning tower b/c he likes it so much). But he likes to nibble what we’re prepping during food prep, and I think that by the time we get to sit for dinner, he’s not hungry enough. So, how do I encourage his curiosity and involvement in the kitchen without ruining his appetite or creating a power struggle / having meltdowns? Also, if he still wants to eat after getting up from the table for a bit and maybe sitting in a different seat, how do we keep him from doing that without mealtime becoming an aversive power struggle? A part of me thinks it’s important for him to sit for family meals, but another part of me is just glad he’s eating, and doesn’t want him to dread meals and develop negative associations. Well, I know exactly what your describing because my third is 17 months old! Helping is great and I don’t want you to discourage that at all, but you may want to limit a bit what he has access to, without him knowing it. Veggies and fruits aren’t going to fill him up much, but carbs and protien will. Do the best you can to limit. As for the highchair, its okay if he comes wondering back over and sits and has a few more bites. If he really starts eating again then try and stick him in his highchair. As he gets older you’ll want to make sure this isn’t a habit or that he just wants to get down and play. Its a little tricky at this age. It’s okay to bend the rules and be flexible with toddlers but you always want to keep the bigger picture in the back of your head. It can be a slippery slope if they start eating other places or outside of the meal regularly. Also, keep in mind that toddlers are so inconsistent with their eating, they will have some meals or even days where they eat very little. That is totally normal.